The Swatlowski Rain Garden, a Chesapeake Riverwise project, was the third place winner in our 2014 Best Urban BMP in the Bay Award contest. 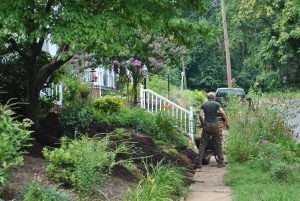 The Chesapeake RiverWise Communities program’s mission is to educate communities about the importance of controlling stormwater, the benefit of using native plants, and how to encourage residents to make informed decisions about how they manage their property to minimize harmful impacts to local waterways. The RiverWise program’s focus is to not only provide local watershed or community organizations with better stormwater information, but also hands-on resources they can use to change local behavior and improve habitat and water quality. Residential scale BMP implementation has been identified as a valuable strategy for meeting stormwater reduction goals. In order for these practices to count towards municipal stormwater requirements training needs to be provided to ensure the practices are installed and maintained in a manner that is accepted by the state, localities, and the Chesapeake Bay Program. Further, local watershed groups need to be connected with their localities in order to relay the information about these BMPs to the locality for credit. The SMART tool was developed and piloted in Maryland, through the Maryland Sea Grant and Alliance is working to bring this tool to Virginia. This tool will provide the method from homeowners to report their stormwater BMPs to the localities, who will verify the installation to receive the reduction credits. A 'fact sheet' on using Residential Stewardship Practices as an urban BMP in the Chesapeake Bay Watershed. The much anticipated "Contractor Specs" developed by the Anne Arundel County Watershed Stewards Academy in partnership with the Center for Watershed Protection. These 'specs' are for designing and installing small scale BMPs. The long-awaited manual for local governments and NGOs on "how-to" build and implement your residential stewardship program. We highly recommend you watch Becoming Riverwise! the first webcast we conducted on this topic which you can do here.